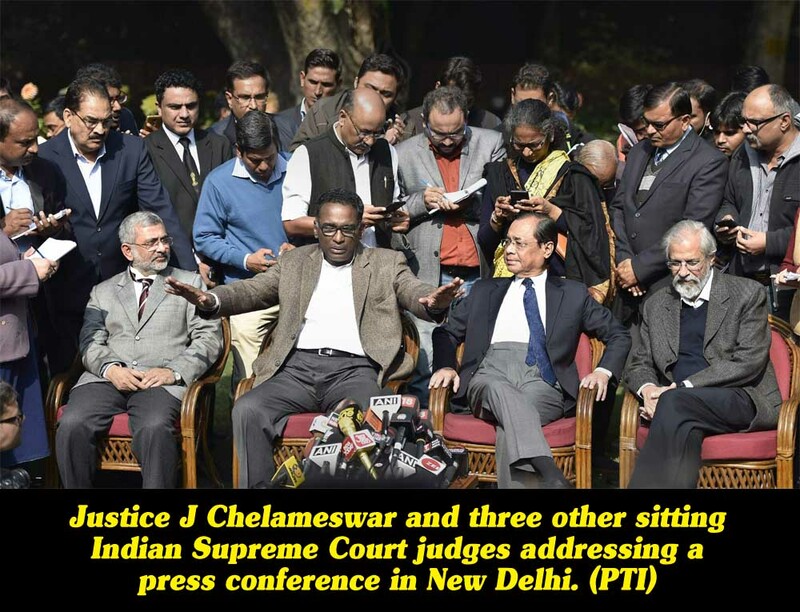 (Lanka-e-News - 01.Feb.2018, 1.45AM) The Lawyers for Democracy wish to express their admiration and appreciation for the action taken by the four Supreme Court judges in India last week, when they took the extraordinary step of holding a press conference to inform the public of irregularities that were happening in case administration in the Supreme Court of India under the leadership of the incumbent Chief Justice. Indian judges took this extraordinary step after informing the Chief Justice that the traditional manner in which the Supreme Court procedures were followed was being flouted by recent actions by the Chief Justice. For example, cases were being fixed for hearing without following the traditional procedures that ensured transparency devoid of bias. The judges had first made their representations to the Chief Justice on these matters, seeking corrective measures. When that failed, the judges took upon themselves the responsibility of informing the public so that the public would do whatever possible to ensure that the best traditions of the administration of justice are preserved. The judges, at the press conference, pointed out that if the present transgressions continue, best practice standards would suffer and a degeneration of the system would take place over the coming years. This extraordinary call for caution demonstrates the uncompromising attitude of Indian judges when it comes to the preservation of the traditions of the independence of judiciary. Instead of keeping silence and letting these transgressions continue, they took their obligations seriously and intervened with the view to informing the public so that the public could make informed interventions to ensure that those responsible for systems of administration preserve the best traditions, on which their own protection depends. This courageous and farsighted action needs to be reflected upon and the lessons of such great interventions should be learned by us in Sri Lanka too. Had there been similar interventions during such transgressions in recent decades, particularly during the administration of Chief Justice Sarath Nanda Silva, our own system would not have suffered the damage that it has unfortunately suffered. Courageous actions, internally and externally, to prevent any interference with the traditions that preserve the independence of judiciary, which win the confidence of the public, are at the very core of the preservation of the rule of law itself. This great learning experience needs to become part of our own traditions. Debates and discussions on these issues in no way damage the image of the judiciary. Instead, it enhances the confidence of the people, as already demonstrated by the extraordinary support the four judges won from the Indian Bar and the Indian public. Therefore, measures such as contempt of court proceedings should never be used in order to prevent vital discussions on the preservation of the best traditions of the judiciary. In Sri Lanka, we are now faced with a situation where a former Chief Justice (one time an Attorney General) and a serving Court of Appeal judge have been charged for corruption. We do not wish to comment on the merits of the case. Our purpose is to draw attention to the fact that two of the judges of the highest courts are facing charges with criminal violations, and how this relates to our institutional problems. The absolute integrity of those who sit in our highest courts is the last and final safeguard of the most important institution protecting the people: the judiciary. When extraordinary problems, such as those manifested in these charges, are brought to the surface, it should be a moment when all concerned with the administration of justice engage in serious reflections about the predicament of the system on which their own survival depends. The survival of traditions protecting the administration of justices is necessary for the entire nation. Therefore, it is the right of the people of the nation to examine the circumstances under which such matters have become possible, examine the root causes of these problems and take immediate measures in order to ensure that correcting lasting actions are taken towards the restoration of the traditions that preserve the independence of judiciary. Such a debate is now a dire need among the public as well as among the lawyers. A fearless but dignified bar is an essential element for the preservation of democratic traditions and the traditions protecting judiciary are at the core. If the lawyers keep silent when the very ground on which their own profession rests is uncertain, and perhaps suffer serious peril, their own capacity to engage in their profession with integrity will suffer greatly. If that happens, that’s a national tragedy. Any attempt by an individual or an association (including the lawyers) challenging, except before a court of law, the authority of the CIOBAC will no doubt amount to an interface of the CIOBAC. What is required is a frank discussion on this case and not a challenge. The democratic means by which such tragedies are prevented is eternal vigilance. Now the time has come to express our own capacity to keep a vigilant eye on our institutions and show that we do have the courage to intervene when interventions are necessary. Let us all emulate the great example set by the four judges of the Indian Supreme Court.